Happy 10th Birthday International Space Station! 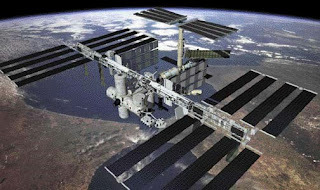 The ISS turned ten today and isn't it truly amazing how time has flown by. In those ten years the station has covered just enough miles in space to have gone to Saturn and back. The station has grown from that first module to the largest man-made object ever put into space. Let's hope that now as construction in nearing an end that we will maximize the potential our orbiting outpost has and leverage it as a platform to assemble and launch other vehicles to enhance our capabilties in space. The work shouldn't end when the construction ends. We'll need a robust vision and plan to keep the station maintained and a vision to continue to enhance its function beyond research. The participating nations in the station program have antied up somewhere in the neighborhood of one-hundred billion dollars to get to where we are today with the U.S. portion of that projected at forty-one billion. With such a world-wide committment and investment we can't walk away now or leave the station to be ravaged by time and space. The right plan and vision and we'll be celebrating another milestone birthday in another ten years. Unfortunately, the answer is yes. I don’t like the answer any more than most Americans. 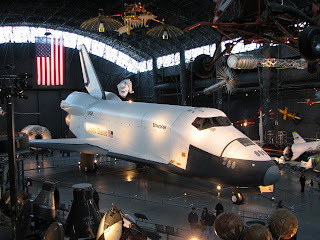 The thought that we’ll be without this magnificent machine and that the remaining fleet of Atlantis, Discovery and Endeavour will be relegated to static displays in a museum would signal the end of an era in spaceflight. A winged space vehicle was the initial dream of Dr. Eugen Sanger and Irene Bredt of the German Air Ministry who in 1944 worked on the calculations for a winged manned rocket bomber. Throughout the fifties the U.S. Air Force worked on its own plans for a winged launch vehicle. That project “Dyna-Soar” which stood for “Dynamic Soaring” eventually fell victim to the “all-hands on deck” approach in the quest for the moon, but the learnings from it and the lifting body program eventually proved useful in the shuttle development. The strategic capability a winged vehicle offers cannot be matched by capsule configurations. It would be a loss to abandon decades of research and work and equally important to lose the strategic value that a winged vehicle can offer by retreating once again to capsule technology. Upon the Shuttle’s retirement America will be without a manned launch capability until the ARES 1 comes on board in 2015 or perhaps a year sooner if the stars align properly and the combination of additional funding and an expeditious vehicle testing program can be achieved.. That’s far too long and it didn’t have to be that way. So retire the vehicle’s we must, but abandon the concept – no. It’s hard to imagine that this could happen to the country that put the first man on the moon; the country that launched probes that have flown to or explored every planet in the solar system (or in the case of New Horizons will fly to). After a carefully orchestrated and very methodical plan to land on the moon through a progressive series of more capable capsules and rockets we hastily searched for an alternative whose function was based not on strategic goals, but on budget constraints. In the twenty-seven years since Columbia’s maiden voyage on April 12. 1981 we have done almost nothing to plan for the inevitable day when a successor to the shuttle would be needed. We’ve squandered the learnings from Apollo and now are about to discard the learnings from the Space Shuttle Program. Let’s look at three key points: 1) Why retire the Shuttle? 2) How did we get in this position? 3) What is the right course for the future? 1) Why retire the Shuttle? – First, I would argue that the Space Shuttle program is in its prime. When the shuttle was designed and the launch stack configured we didn’t realize the full capabilities or dangers of the system. It wasn’t until the loss of shuttle’s Challenger and Columbia that we began to understand how complex and dangerous a machine this is. However, we have painfully and slowly figured out over time how it works and how to make it fly safely and we’re doing it just as the program is ending. Any rocket launch is dangerous and carries the risk of failure, the shuttle with a million moving parts is in a higher risk category, but that isn’t the main driver behind retirement. Of all the lessons we’ve learned about how the shuttle operates and the dangers involved in spaceflight there is a category where we still know little about and it carries potentially the biggest unknown risk: Age. Everything in nature ages and usually does so until the point where graceful aging transforms into breakdown and failure. With the youngest shuttle Endeavour at seventeen years old and the oldest active shuttle at twenty-five years old (Columbia was older, but was lost on reentry) we have now chartered into unknown waters as to the effects age has on metal fatigue, corrosion in the airframe and deterioration of the wiring inside the shuttle’s complex shell. We don’t’ have to look far to see how we’ve been “surprised” by event’s that were previously not thought to be issues until a disaster struck. An F-15 fighter breaks apart in mid-air due to metal fatigue in its airframe. So concerned is the Air Force about this problem that pilots are instructed to avoid unnecessarily overstressing the aircraft with excessive speed or maneuvers for fear that they will fail. How about the airline whose aging 747’s wiring caused a spark that ignited the center fuel tank because the casing around the wires had worn or cracked due to friction and age? These are things that we should have known about and anticipated, but didn’t think about until tragedy struck. The shuttle deals with one other issue that other complex machines don’t have to worry about. When the shuttle isn’t flying into or returning from space it sits at the Kennedy Space Center just miles from the Atlantic Ocean. Inspections on the shuttle have shown some corrosion due to constant exposure to the moist salt laden air. Without disassembling every part and every inch of airframe and wiring we can’t eliminate that age is an increasing safety issue in shuttle flights. Aging is a risk – How big a risk we don’t’ know, perhaps small enough to run out the planned shuttle schedule, but as we’ve seen in other craft it can happen at anytime. Even though the airframe is put through enormous stress and strain at launch and reentry what we did learn from the Columbia disaster that even as the shuttle was losing it’s structural integrity as the interior of the left wing began to melt the shuttle fought the strain and held together longer that anyone thought possible. These are incredibly well-built machines, but not invincible. 2) How did we get in this position? – The “how” we got here is well documented and a lesson for future leaders of how not to manage our space program. I haven’t thought much over the years about “what if we didn’t have a space race with the Soviets”. Would we have methodically laid out a long-term, well-paced, sustainable vision for space exploration? We landed on the moon because we were in a race, we pushed the limits of technology and took great risks and overall we escaped without a loss of crew in space. Kennedy’s defeat of Nixon in 1960 set the stage for the first space race. Nixon’s victory in 1968 allowed him to bask in the glory of Kennedy’s goal and the accomplishment of man’s greatest achievement, but as men were walking on the moon Nixon was already on the verge of canceling the program and he did cancel the last few scheduled flights not because of risks, but because of budget constraints due largely to the costs of the Vietnam War. Nixon was cool towards the space program. It wasn’t something he championed and despite being in the enviable position of being able to pick up on Kennedy’s challenge and take us a step further he only wanted to keep it on life support. “If” it had to be done how could it be done as cost-effective as possible? It would be Nixon’s staff that sold him on the space program. Without John Ehrlichman and Casper Weinberger pushing a space capability we would have been without a manned program long after Apollo ended. To meet Nixon’s “do it cheaper” mantra required revision after revision to the shuttle design. In the end what resulted was a smaller, multipurpose vehicle. What was lost was a heavy-lift capability to launch bigger components into space and a lighter capability to launch crew only. It took only eight years of aggressive determination to step through a program to land on the moon and then thirty six years after the last moon landing to circle back to a place where we were before only this time we need to reinvent a new way to accomplish old things and again the driver is not strategy, but budget. Had we maintained the Saturn S1-B for crew capsule launch, the Saturn V for heavy lift and smaller versions of the shuttle for crew delivery and an unmanned shuttle for medium lift we would have created a sustainable, robust program that leveraged all the knowledge we’d accumulated. The strategy we followed was a course that lost our leverage and our learnings to time only to land us back in the late 1960’s where we find ourselves again in turbulent times, facing an economic crisis, a war and at a crossroads for the space program. 3) What is the right course for the future? - The planned ARES V is a must have to add a sorely missed heavy-lift capability, after that the needs become debatable. Should be move back to a capsule configuration? In a perfect world we would have more than one choice. A capsule and ARES I configuration as needed for specific missions and a lighter HL-20 type craft for transport of crew only to and from low earth orbit (International Space Station). Combine that with a new fleet of unmanned shuttles that could deliver medium lift capability such as supplies, fuel and station components would allow the United States to retain the use of shuttle facilities and manufacturing while eliminating risk and costs by converting the configuration to an unmanned capability. This configuration would provide versatility to the program and not the Swiss Army Knife approach of having a one size fits all. It doesn’t work and it’s not cost effective over the long run. So yes we need to retire the shuttle, but we need to leverage the fifty years of knowledge we’ve developed about space and spacecraft. We need a sustainable approach that we can build on to accomplish our goals and leverage what we’ve built, a strategy that is cost-effective over decades because it is a staged, progressive plan that isn’t dependent on a single capability, but a versatile one and not just one that fits a budget today – and of course one that includes a winged launch vehicle. The shuttle fleet has served us well and taught us many lessons about operating in space and about winged, reusable space vehicles. To watch a launch and landing of this incredible machine is a spectacular sight and one we'll miss, but the time has come to pass the torch and look at the next generation of space vehicles and where the program needs to be twenty-five years from now. Read more about how we can create a robust American space program by visiting my report on Creating a Sustainable Manned Spaceflight Strategy.